Rain ensured an early end to a high-scoring encounter between Lancashire and Surrey, with no play possible on day four at Guildford. 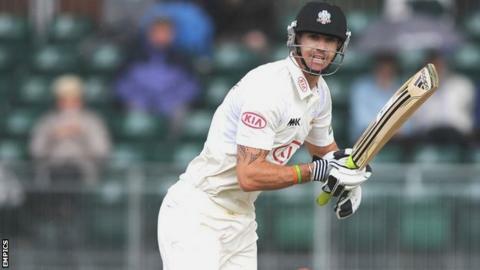 Kevin Pietersen's double hundred on the Friday ensured the hosts picked up five batting points to add to their five with the ball. Lancashire took a priceless eight bonus points, thanks to centuries from Steven Croft and Paul Horton. Both sit above Durham and Warwickshire, who occupy the relegation places. The visitors have now lost almost 74 hours' play in the County Championship this season and Surrey more than 65 hours. "The weather's been around for most team this week, it's been looming,"
"We've got away with more cricket than most, but the way the game was balanced, I don't think either team were particularly confident of the result. "To come out of the Twenty20s and score 485 and declare is a big positive, and to apply ourselves mentally after a three week break is a tough task but we managed it." "There was a glimmer of a positive result, and if we'd had a full days play with Kevin still at the crease, early quick runs this morning could have made it an interesting afternoon. "It was very very wet after overnight rain, and the umpires have called it, the right decision, but I have to say it could have been interesting. "Kevin has power, but there was craft and skill to his play that set him on his own and proved why he's such a world-class special player." "So yet again the appalling summer weather had the final word at Guildford, with play called off shortly after 12.30 following heavy overnight rain. "Lancashire will be pleased that Paul Horton and Stephen Croft both of whom scored centuries in this game are in excellent form, particularly with an important Championship match looming against struggling Worcestershire on Wednesday. "The bowlers will also be pleased that despite the onslaught from Kevin Pieterson, they generally bowled well and got some much needed overs under their belts. "The Champions may struggle to retain their crown this season, but the indications are that Lancashire and returning to something approaching their best form, which should augur well for the rest of the season.